Since postmodernist relativists are so inconsistent–they say there is no metanarrative even though their denial of a metanarrative is itself a metanarrative–I decided to search for a consistent postmodernist. Such a consistent creature would be mad–indeed It would be Madness Itself since a deconstruction of all narratives includes a deconstruction of the self–and thus the destruction of the self. If only fragments of self really remain, where can we find a god that consists of such chaos. 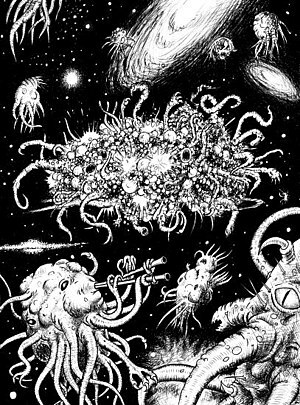 H. P. Lovecraft, the great American writer of fantastic fiction has the answer–the blind mindless deity Azathoth. If academic postmodernists and their followers were consistent, they would emulate Azathoth. Their lives would be as disorderly as Azathoth’s–they would be insane to the point that the worst current case of schizophrenia would seem normal by comparison. But most of these postmodernists live orderly lives–they get married, have families, teach for many years until they retire, grade student papers according to a standard–they do not literally try to deconstruct everything. They are hypocrites. When I see a mindless postmodernist sitting catatonic in the center of a circle of raving postmodernists playing dissonant pipes, I will take these pseudo-academics seriously. Otherwise, they should work to be more consistent in their madness. Until then, may Azathoth rant and scream mad non-words that echo through the mindless postmodern universe.